Firefly Linux was a lightweight operating system designed with netbooks in mind. Based on Arch Linux, it comes with the small and fast LXDE desktop environment, many popular applications, and out-of-the-box support for wireless networks, sound cards and graphics cards. Firefly Linux includes some non-free software, including the Flash browser plugin and Skype telephony software, while thousands of additional packages are available for installation via the distribution's command-line or graphical package management tools. Rate this project Voyager Live is an Xubuntu-based distribution and live DVD showcasing the Xfce desktop environment for French users. The project latest release, Voyager Live 18.04, is a long term support release offering three years of support. An English translation of the original French release announcement reads: "I present you with Voyager 18.04 LTS with three years of long-term support (LTS), until April 2021. A variant based on Xubuntu 18.04 (Bionic Beaver) with the Xfce desktop and version 4.15 of the Linux kernel. This project is done by a team who I wish to thank for their valuable work. Attention, Voyager is only a pushed variant of Xubuntu. The entire internal structure of Xubuntu 18.04 LTS is left by default to avoid any security issues and packages. All updates come from official Ubuntu. Voyager 18.04 LTS is multi-profile and multitasking in an aesthetic and immersive environment as much as possible and this, since the origins of Voyager, is so that the time spent on your machine is more enjoyable." Download (MD5) the live DVD image for your preferred architecture from SourceForge: Voyager-18.04-amd64.iso (1,570MB, pkglist), Voyager-18.04-i386.iso (1,582MB). • 2015-03-27: Distribution Release: Voyager Live 14.04.4 "X"
The Voyager Live team has announced a new version of the project's Ubuntu-based distribution. The new release, Voyager Live 18.10, switches from using the Xfce desktop to using GNOME Shell as the default interface. An English translation of the original French release announcement reads: "I present to you for the first time: Voyager - GE 18.10 based on the GNOME Shell desktop and Ubuntu 18.10 (Cosmic Cuttlefish). Why GNOME Shell now? Voyager abandoned the GNOME Shell desktop 10 years ago for Xfce, because of its youth and especially because lack of flexibility and extensions were problematic at the time. Now, after several tests, the conclusion is that part of the GNOME Shell system is again ergonomic, customisable and more flexible than it was in the beginning. So it was considered to make a version named GE for GNOME Shell. Why the intermediate version with 9 months of support in 18.10 and not 18.04 LTS with its 3 years of support? Because GNOME Shell 3.30.1 does not install on the Ubuntu 18.04 LTS and because 3.30 is much better than the 3.28 which is taking too many system resources. So here we are with this new digital and human adventure." The new release offers nine months of support. Download (MD5) from SourceForge: Voyager-GE-18.10-amd64.iso (1,862MB, torrent, pkglist). Rodolphe Bachelart has announced the release of Voyager Live 9, a brand-new version of the project's desktop Linux distribution featuring a highly customised Xfce desktop with many user-friendly enhancements. This release, based on Debian 9, is built around the Xfce 4.12 desktop, coupled with Linux kernel 4.9.30. The entire Voyager structure has been re-coded and cleaned up, while the scripts have been modified to accommodate the Xfce 4.12 desktop and its components. This is a version which aims to provide the latest Xfce on Debian for both recent and old machines, with new ergonomics which are already part of the (Ubuntu-based) Voyager 16.04.2, as well as new themes, software and scripts. GParted is now included in the live image so users who have a problem using the Debian installer's disk partitioner, can perform manual partitioning before installation. A tutorial is provided in Thunar live in both French and English. Three editions will be available - two x86_64 image with EFI and non-EFI support (labelled as "gpc") and an i686 PAE variant (not yet released at the time of writing)." See the release announcement (in French) for further information and screenshots. The distribution supports both French and English; download (MD5) links: Voyager-9-Debian-efi-amd64.iso (1,730MB, pkglist), Voyager-9-Debian-gpc-amd64.iso (1,730MB). The developers of Voyager Live, a desktop distribution based on Xubuntu, have released a new version. The new release, Voyager Live 16.04, is based on Xubuntu 16.04 and ships with the Xfce 4.12 desktop environment. The new release will receive three years of security updates. The release announcement includes a list of updated packages: "Xfce 4.12 Xfdashboad 0.5.92, 0.0.2 plugin Xfce4 hotcorner, Plank 0.11.1 Dock, Conky, Yad, Smtube 16.3.0, Kodi Media Center 16.1 Mpv Media Player, Word, Caffeine, GIMP 2.8.16, Gthumb, Pitivi 0.95.1, Clementine 1.3.1, 1.7.3 CoverGloobus, RadioTray 0 / 7.3, Kazam, Transmission, Terminator, Ranger Terminal, Moc Audio, Lynis, rkhunter, Clamav Antivirus 5.20.1 clamtk, Repair Boot, OS-Uninstaller PulseAudio Equalizer, Cheese, Impulse, Screenlets 0.1.6, Déjà Dup, GRUB Customizer, BleachBit, Firewall Gfuw, Synaptic, Corebird Twitter 1.1.1, Thunderbird 38.7.2, Firefox 46, Pidgin, LibreOffice 5.1, GNOME Calendar, Kupfer, Mintstick USB 1.2.8, Ubuntu After Install Mod 2.7, GNOME Software, Xscreensaver 5.34..." Download (MD5): Voyager-16.04-amd64.iso (1,235MB, pkglist). The developers of Voyager Live, a Debian-based distribution, have announced the release of Voyager Live X8. The new release of Voyager Live is based on Debian 8 "Jessie" and ships with Xfce 4.12 as the distribution's default desktop environment. According to the project's website, Voyager X8 ships with version 3.16 of the Linux kernel and seeks to gain performance by shipping with Xfce desktop environment. The release announcement also lists popular desktop software available in, including Conky, Smtube, Kodi/XBMC Media Center, VLC, GIMP, Clementine, CoverGloobus, RadioTray, Slingscold, Skippy-xd, Kazam, and Transmission. This release of Voyager includes support for booting on UEFI-enabled hardware and offers different installation media for people who wish to work with (or without) UEFI support. Version X8 of Voyager is intended to be a long term support release with five years of security updates. Further information on Voyager X8, along with a collection of screen shots, can be found in the project's release announcement (in French). Downloads (MD5) (pkglist) : Voyager-X8-efi-amd64.iso (1,225MB), Voyager-X8-amd64.iso (1,225MB). 2015-03-27 Distribution Release: Voyager Live 14.04.4 "X"
Rodolphe Bachelart has announced the availability of a new edition of Voyager Live. 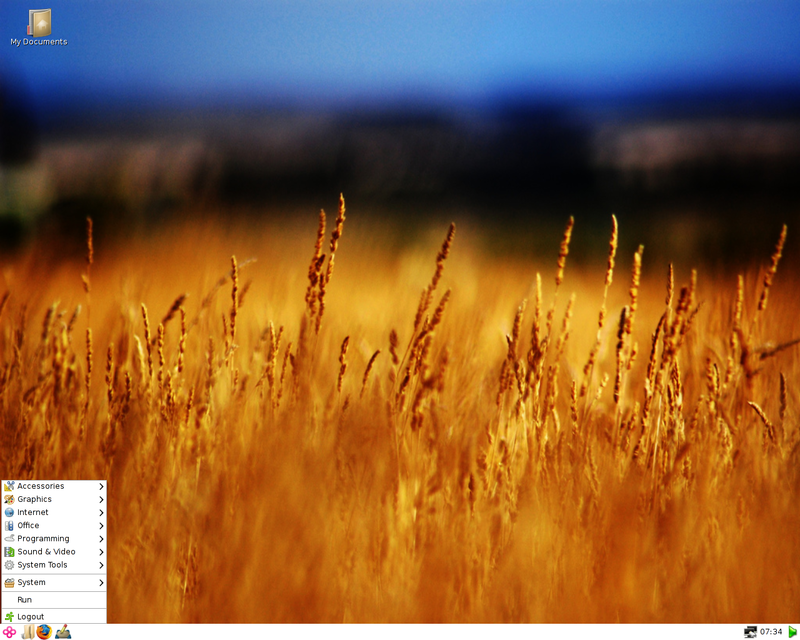 Voyager "X", based on Voyager 14.04.4 LTS, is an experimental version built around the new Xfce 4.12 desktop which was only recently released. It also includes an updated Linux kernel, version 3.16. The entire layout of the desktop has been recoded and the scripts improved to work with the new Xfce. This is a version whose goal is to bring the latest Xfce and kernel improvements to some of the more recent computer systems. Although Xfce 4.12 is final, it has yet to be integrated into Ubuntu's official repositories; as such, it is considered as experimental. At the moment only a 64-bit ISO image is available for download, with a 32-bit variant possibly coming later if needed. This version of Voyager X has been tested extensively and it can be installed as an "official" Voyager. Xfce 4.12, coupled with Linux kernel 3.16, has made Voyager faster and more responsive, with many parameters optimised for better performance and with much improved hardware support. The release announcement (in French) offers more details and several screenshots. The announcement warns that due to the young nature of Xfce 4.12 and some Voyager features, users should backup their data prior to upgrading to the new release. Download (MD5) from SourceForge: Voyager-X-14.04.04-amd64.iso (999MB). 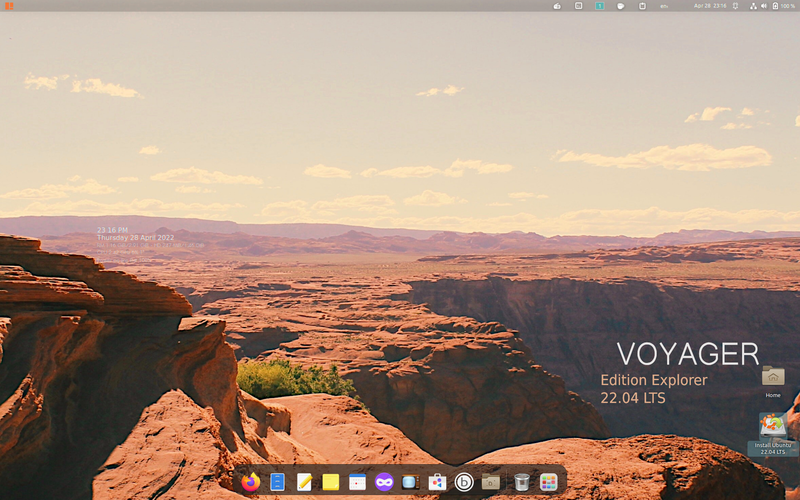 Rodolphe Bachelart has announced the release of Voyager Live 14.04, a Xubuntu-based distribution with a customised Xfce 4.11 desktop and a large number of usability improvements designed for power users and multimedia fans. Some of the new features of this release include: new light and dark themes, as well as a new icon set; Bluetooth and print services are now disabled by default; workspace switch by mouse action; Impulse screenlets for music integrated in panel; tightly integrated and automated music application trio - Clementine, Covergloobus and Impulse; detachable SMTube for viewing YouTube videos; a panel applet for graphical measurement of Internet traffic; a modified Whisker menu with additional configuration options... There are many more improvements as documented in the detailed release announcement (in French) with screenshots. Although the project's website is in French only, the live DVD image boots, by default, into an English user interface. Download (MD5) from here: Voyager-14.04-amd64.iso (983MB). Voyager Live 13.10 has been released. Voyager Live is a Xubuntu-based distribution with a highly customised Xfce desktop and a large number of usability improvements. These include retractable dynamic panels, the Skippy "exposé" plugin, and the Slingscold launcher for starting applications. Also presented on the desktop are Plank, a configurable and responsive dock for launching programs, a much-improved "Box Wall" for changing themes on the four virtual desktops, an excellent backup utility called "Box Backup", a new Conky control tool, and Startpages that allow to append applications and websites to any of the virtual desktops. There is much more - the comprehensive release announcement which includes plenty of screenshots to illustrate the ergonomic and usability enhancements to the Xfce desktop is in French only, but the distribution actually defaults to English and it also supports a number of other languages. Download (MD5) the live DVD image from SourceForge: Voyager-13.10-amd64.iso (965MB).